On the fifteenth of this month [August], we commemorate the revered Metastasis of our Most-Glorious Lady the Theotokos and Ever-Virgin Mary. Since, in the flesh, the world’s Maker died also. God’s Mother lives forever, though she died on the fifteenth. When our Lord Jesus Christ wanted to receive for Himself His own Mother, three days beforehand He revealed through an Angel (it is said it was the Archangel Gabriel) her Metastasis* from earth to heaven. The Angel came to her and said: "Thus says your Son: 'It is time to receive My Mother to Myself. Wherefore do not be troubled by this, but receive My message with gladness, for you are passing over to life eternal.'" Having learned this, the Theotokos rejoiced with great joy. And therefore moved by her longing to pass over to her Son, she speedily and eagerly went up to the Mount of Olives to pray (the All-Hymned One had the habit of frequently going up to this mountain to pray). This was followed by an amazing wonder. For when the Theotokos went up there, the trees at the peak which were planted there on the mountain bent forward, as if they were animate and rational, and so they venerated her, giving to her that which is proper, revering and honoring the Lady of the world and Mistress. Having sufficiently prayed the All-Immaculate One returned to her house, and O the wonder! straightway she was entirely shaken. Then the Mistress lit many lights, and thanked God, and invited over her relatives and neighbors. She swept her house and made ready her deathbed, and prepared everything necessary for her burial. After this she revealed to the other women the words of the Angel concerning her metastasis to heaven. And with this news which they received with faith, she showed them the joyous and victorious sign given to her by the Angel, namely a branch from a palm tree. When the invited women heard the sad news, they mourned, and with tears they washed their faces, along with piteous voices of lament. Ceasing from their mourning, they begged the Mistress to not leave them as orphans. The Theotokos assured them, that with her metastasis to the heavens, she will guard not only them but the entire world. Thus with these words of consolation, their extravagant sadness ceased. Then the All-Pure One divided the two garments she owned between two widows who were her friends and acquaintances, who were reared by her, giving to each one garment. At the time the All-Blameless One made this division, O the miracle! suddenly there was a loud thunderous noise, and many clouds gathered there, which had snatched from the far ends of the world the Apostles, and brought them to the house of the Theotokos. Together with the Apostles was Dionysius the Areopagite, Saint Hierotheos the teacher of Dionysius, the Apostle Timothy, and other divinely-wise Hierarchs who were brought by the clouds. When they learned for what cause they were suddenly and strangely gathered together, they said to the Theotokos: "You Mistress, seeing you live and reside in the world, we were comforted, as if we were seeing your Son and our Master and Teacher. Because now you are passing over to the heavens according to the will of your Son and God, for this we lament, as you see, and weep. Yet we also rejoice, for all that has been set in order on your behalf." Saying these things, their faces were wet with tears. The Theotokos then responded to them: "O friends and disciples of my Son and God, do not mourn and be sad for my joy. But bury my body, in the way I am formed on my deathbed." Having said these things, behold the divinely-sweet Apostle Paul arrived, that chosen vessel, and he fell at the feet of the Mother of God, and venerated her. And opening his mouth, he praised her with many and heavenly encomiums, saying: "Rejoice, O Mother of life, and my own preaching and pretext; for, although I did not physically see on earth your Son, I saw you, and it was as if I saw Him." After these things, the Virgin bid her farewell, and reclined on her deathbed, forming her All-Immaculate body as she wished. Offering entreaties and supplications to her Son for the sustenance and peace of the entire world, she then filled the Apostles and Hierarchs with the blessings of her Son, given through her for humanity. She then delivered into the hands of her Son and God, her all-illumined and All-Holy soul. Then Peter the Leader of the Apostles, was the first to begin saying the lamentations at her tomb, while the other Apostles lifted up her deathbed. And others walked ahead before them, holding lamps and lights, and chanting hymns. Others followed, escorting to the tomb the God-received body of the Mother of God. Then Angels were heard chanting from the heavens, and the voices of the bodiless Powers filled the air. 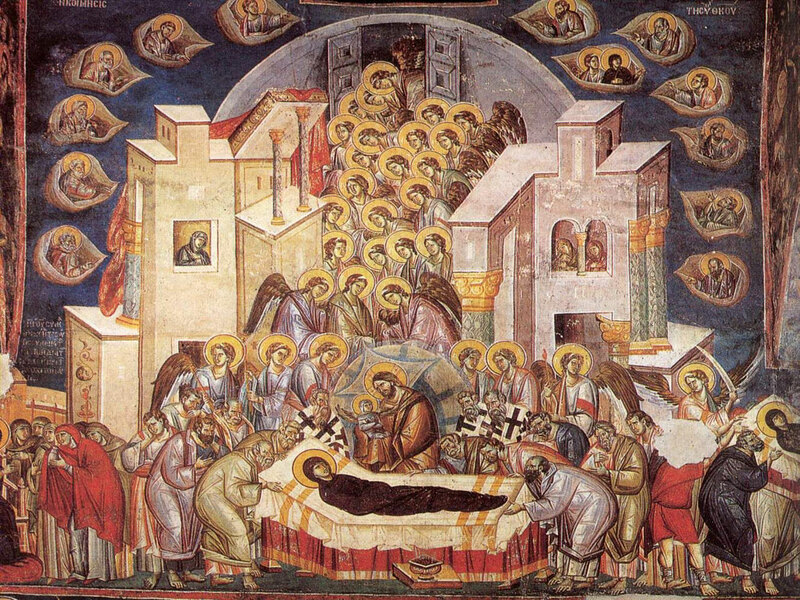 Such things the envious leaders of the Jews were unable to see and hear, so they were determined to have the deathbed which carried the life-giving body of the Theotokos hurled to the ground. But divine justice caught up with them and chastised those who dared do such a thing, and they were all blinded. One of them not only lost his sight, but also his hands, because of all of these he dared to grab on to the sacred bed, and so his daring hands remained clinging to the bed, which had been cut off by divine justice. This wretched man became a pitiful and worthy of tears sight to behold. But having come to believe with his entire soul, not only was he healed and his health was restored to him as before, but he also became the cause for the healing and salvation of all those who had been blinded. For a portion of the clothing of the Theotokos had been taken, and after it was placed on the blinded men, O the miracle! they were healed of the suffering of their blindness, as well as the suffering of their disbelief. When the Apostles arrived at the place of Gethsemane, they entombed the All-Pure body of the Theotokos, and they remained there for three days, listening without ceasing throughout that time, the hymns and voices of the Holy Angels. 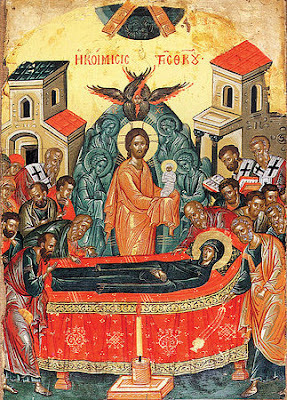 Because by divine economy, as we sing, one of the Apostles (namely Thomas, according to many) was not present at the burial of the life-giving body of the Mother of God, but arrived on the third day, he was greatly saddened for having not being found worthy to see these things as seen by the other Apostles. 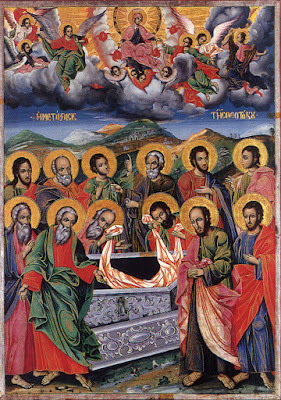 Wherefore by a common decision all the Apostles opened the tomb so that this Apostle could venerate the body of the Theotokos. Opening the tomb, they were all astonished. 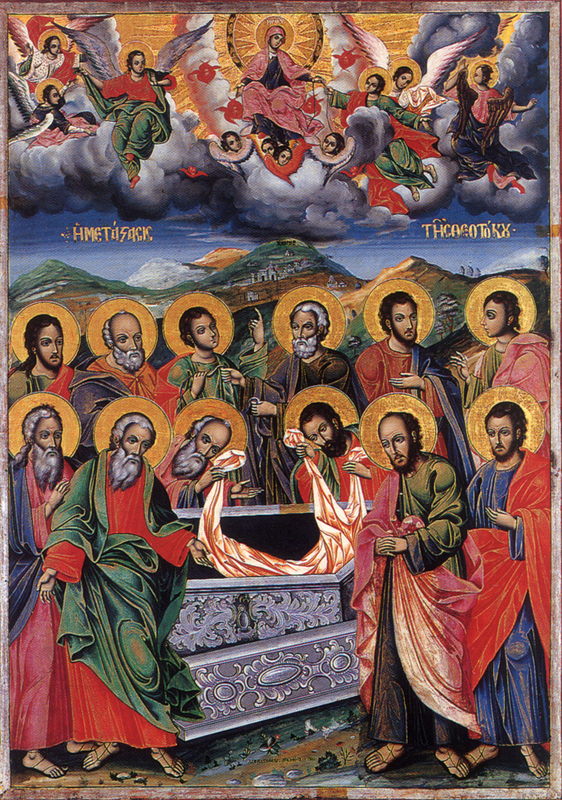 For they found the tomb was lacking the body, with only a cloth present, left behind for the consolation of the Apostles, for they were destined to be saddened, and as a testimony and proof without deceit of the transposition from the tomb of the Theotokos. For even until now, this tomb which was carved from rock, can be seen and venerated although it lacks a body. This Synaxis and Feast is celebrated in the revered house of Blachernae, and the festival is kept in all the local Churches. * Metastasis is translated as either "translocation", "transposition" or "translation", with the meaning that her body was located in one place and brought to another. 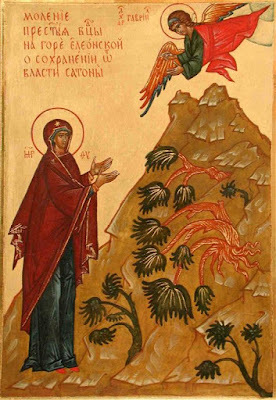 According to St. Nikodemos the Hagiorite, there was not only a metastasis of her body, but we can also say there was a resurrection of her body, and an ascension to the heavens. This is elaborated in the homilies and hymns of Andrew of Crete, John of Damascus, Theodore the Studite, Mark of Ephesus, Gregory Palamas and Kosmas the Hymnographer which are dedicated to the Dormition. St. Nikodemos then asks why we call it a Metastasis and not a Resurrection and Ascension? He answers that this is perhaps because it is not in the writings of Holy Scripture, but it is a secret doctrine passed on by the Holy Fathers orally and not through public proclamation. As St. Basil the Great writes: "Of the dogmas and preachings kept safely in the Church, we have some from written doctrine, and some from tradition handed down to us by the Apostles we have received in secret, both of which have the same validity and force as regards the piety; accordingly, no one gainsays these, at least no one that has any experience at all in ecclesiastical matters. For if we should undertake to discard the unwritten traditions of customs, on the score that they have no great force, we should unwittingly damage the Gospel in vital parts, and should rather be left with preaching confined to the mere name" (On the Holy Spirit, Ch. 27). St. Nikodemos further explains that the word metastasis denotes both a resurrection and an ascension, for one who has risen and ascended has metastasized, going from one place to another. He therefore concludes: "Those who think the Theotokos as not having been raised, namely that her holy soul was united with her immaculate body, nor that her body is alive in the heavens, but is dead and separated from her life-giving soul, are not of correct thought." Neither the tomb nor death could hold the Theotokos, who is sleepless in her intercessions and an unchanging hope in her mediations. For as the Mother of Life she was translated to life, by Him Who dwelt in her ever-virgin womb. Set a rampart about my mind, O my Savior, for I make bold to sing the praises of Thy most-pure Mother, the rampart of the world. Establish me firmly within the fortress of my words and make me strong within the defenses of my thoughts: for Thou dost promise to fulfill the petitions of those that entreat Thee with faith. Endue me with a tongue and ready speech, and with thoughts that are without shame; for every gift of enlightenment is sent down from Thee, O guiding Light, Who dwelt in her ever-virgin womb. 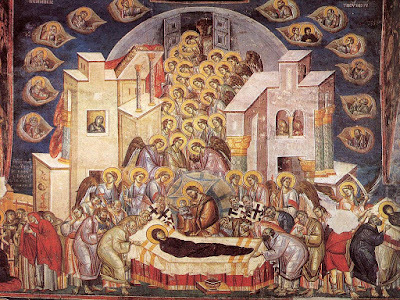 Verily, the clouds, O Theotokos, Mother of Life, at thy death-free falling-asleep, caught up the Apostles into the sky; and after they were all dispersed throughout the world gathered them into one rank beside thy pure body, which, when they had reverently laid it away, they sang with the tone of Gabriel, saying, Rejoice, O full of grace, the unwedded virgin Mother, the Lord be with thee. With them, therefore, beseech thou Him, for He is thy Son and our God, to save our souls.